The current mini-retrospective of renowned American artist Beverly Pepper (b. 1922) at Kayne Griffin Corcoran simply stopped me in my tracks. I've encountered on occasion one or two of her sculptures, but never seen an exhibition solely dedicated to her. This one, elegantly installed at Kayne Griffin Corcoran, is the first major solo exhibition of her works in L.A.
Bottom: Beverly Pepper, Drusilla Senior, 2014. Cor-ten steel. 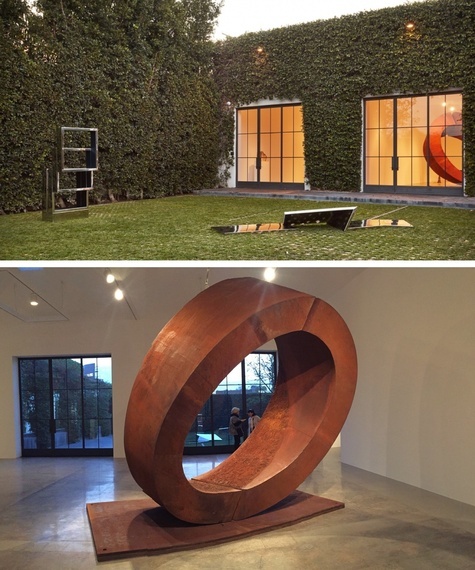 Upon entering the gallery's courtyard designed by James Turrell, you encounter several stainless steel sculptures made by Beverly Pepper in the late 60s and early 70s. 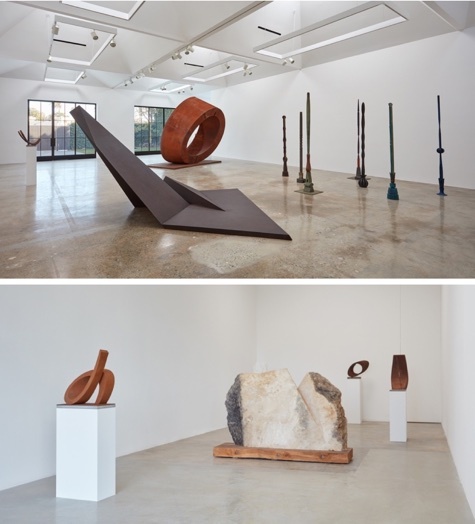 These medium-sized sculptures, with their minimalistic geometric forms, have an unexpectedly theatrical effect. Their polished metal surfaces reflect not only the garden's luscious vegetation, but also mirror any curious visitor taking a closer look. To be completely honest, until seeing this mini-retrospective, I was not aware of Pepper's age. She is 94 years old, but seeing her recent works bursting with energy, I prefer to say that she is 94 years young. Once inside of the main gallery, your attention is grabbed by the monumental Cor-ten steel sculpture Drusilla Senior executed just a couple of years ago, in 2014. Only when walking around this seemingly simple oval-shaped structure do you discover its true complexity -- a rare combination of brutality and elegance, machismo and grace. 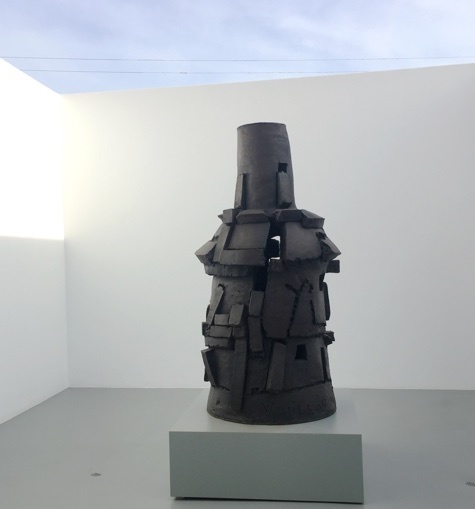 In the same room is another large scale Cor-ten steel sculpture Dallas Pyramid (1971). It's hard to believe that it was executed almost fifty years ago. Its sharp, protruding angles stand in dramatic contrast to the soft curves of Drusilla Senior, the sculpture I spoke of before. There are a few smaller recent sculptures on display as well, some made of stone and Carrara marble. Knowing that Beverly Pepper has lived in Italy for most of her adult life, it's not surprising to see in her art the influence of Roman antiquity -- the ruins of amphitheaters, obelisks, temple columns. At center: Charles Garabedian, Study for Illiad, 1991. Acrylic on canvas. 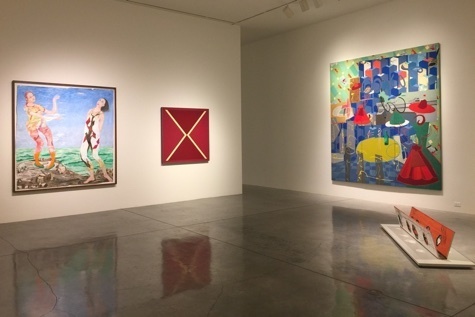 The new exhibition at L.A. Louver pays a special tribute to the "idiosyncratic and compelling" art of Charles Garabedian, one of the best known Los Angeles artists, who sadly passed away last year at the age of 93. 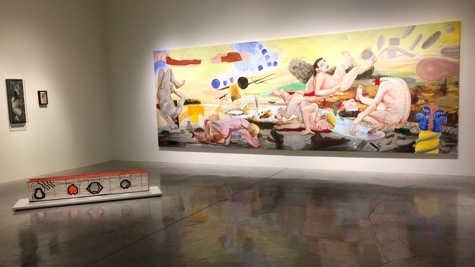 I first encountered Garabedian's work decades ago and I was immediately amazed by his ability to evoke the spirit of Greek tragedies in monumental paintings inspired by Homer's epics. There is something tragic yet naïve about his 1991 painting Study for the Illiad, populated by endearingly clumsy naked figures of men and women: standing, stumbling, falling, and laying down. Charles Garabedian came to painting at the age of 32, after serving in the army in World War II, during which he flew numerous bombing missions in Europe. One could imagine the deep emotional impact on his psyche of observing so much death and cruelty. All of this profoundly informs the aesthetic and emotional content of many of his works. 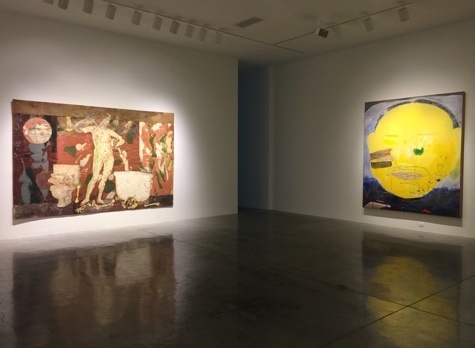 The exhibition pays homage not only to Charles Garabedian, but also to a number of his contemporaries -- John Altoon, Tony Berlant, Richard Diebenkorn, Peter Voulkos, Ed Moses, and the list goes on. Some of these artists were his close friends. Officially, the exhibition opens this coming Saturday after a memorial celebration of Charles Garabedian's life at the Broad Stage in Santa Monica at 11am. However, if you're eager to see this exhibition at L.A. Louver Gallery, it's already open to visitors. A memorial celebration for Charles Garabedian will be held on Saturday, 11 February 2017, 11am at The Broad Stage, 1310 11th Street, Santa Monica, CA 90401. Please call (310) 822-4955 to RSVP.